This is the second article in the series of articles on Difference Between Temporary Table and Table Variable. This article provides the Comparative Analysis of Temporary Table and Table Variable based on the aspects like Syntax, Storage Location and Transactions with extensive list of examples. 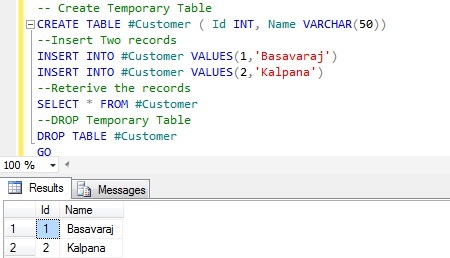 Demo 1: Below is the sample example of Creating a Temporary Table, Inserting records into it, retrieving the rows from it and then finally dropping the created Temporary Table. 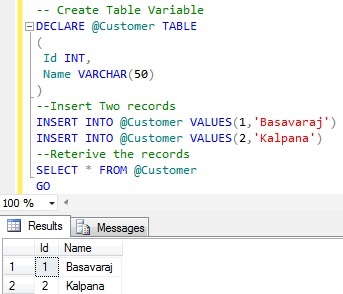 Demo 1: Below is the sample example of Declaring a Table Variable, Inserting records into it and retrieving the rows from it. Table Variable doesn’t support DDL statements like ALTER, CREATE, DROP etc, implies we can’t modify the structure of Table variable nor we can drop it explicitly. Demo 1: Sys.Tables can be used to prove that Table Variables are created in TempDB. From the above result it is clear that the Table Variables are created in TempDb as we are seeing an entry getting into the Sys.Tables of TempDB. 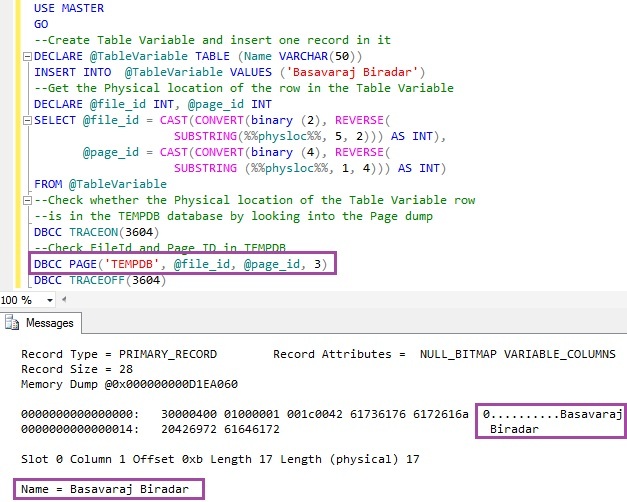 Demo 2: In this demo we will see that the data in the Table Variable is stored in the data pages of the TempDB data file. To prove this I will be using some of the Sql Server Undocumented and Unsupported Sql Server features, so use at your own risk. From the above result it is clear that the physical location of the Table Variable row is in the TempDB database’s data file. The Undocumented DBCC PAGE statements first parameter passed in the above script is TempDB, the second parameter is the physical file_id of the Table variable row and third parameter is the page_id of the Table Variable row within the data file. Fourth parameter is the level of detailed information required in the output. 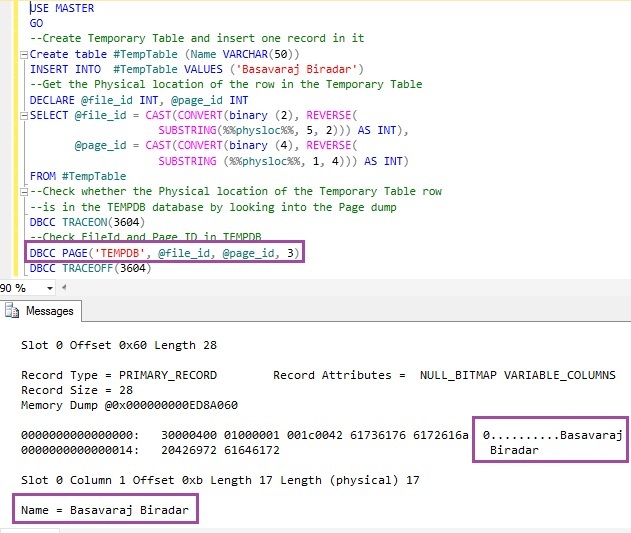 Demo 1: Sys.Tables can be used to prove that Temporary Tables are created in TempDB. Demo 2: In this demo we will see that the data in the Temporary Table is stored in the data page of the TempDB data file. To prove this I will be using some of the Sql Server Undocumented and Unsupported Sql Server features, so use at your own risk. From the above result it is clear that the physical location of the Temporary Table row is also in the TempDB database’s data file. Table variables doesn’t participate in the explicit transactions defined by the user, where as Temporary Tables honor the Transactions. Demo 1: Table variables doesn’t participate in the explicit transactions defined by the user. RESULT: ROLLBACK TRAN statement didn’t revert back the record inserted in the Table variable within a Transaction. RESULT: ROLLBACK TRAN statement reverted back the record which is inserted in the Temporary Table within a Transaction. Thank you so much Basavaraj ! Now, I have no doubt about table variable storage. Comments are updated properly for above line. Nice explanation. I liked reading the blog..